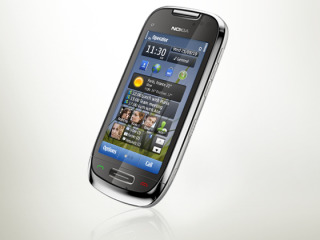 O2 has confirmed to TechRadar that it will be stocking the new Nokia C7 in the UK. The new handset, which offers a sleek 10.5mm-thin chassis with OLED display, is set to be one of the more exciting mid-range phones in 2010. And O2 is the first out the blocks to announce it will be stocking it, with a predicted UK release date of later this year. Helpfully, O2 couldn't tell us anything interesting like a UK release date or UK pricing, but Nokia has dropped a few hints to the latter. Given that the Nokia C7 is going to be offered SIM free for €335 when it goes on sale worldwide in Q4, which means it will probably be well south of the £300 in the UK. We'd imagine that O2 will be offering it for free on 24-month deals and some 18-month contracts - but we're just glad that Nokia is finally ditching the resistive screens and bringing out attractive capacitive OLED ones instead to care that much.